The Queenmaker series is set in the world of Heimgard. It's a world of icy fjords, murky pine forests, and volcanic islands. The people are as fierce as the landscape—warriors, plotters, raiders, and dreamers. There are three realms in the Eastern Lands of Heimgard: the wild Thrym, from the far north; the pastoral Earnfoldings, from the middle kingdom; and the decadent Oescans to the south. The Thrym are a hardy, seafaring people, shaped by their unforgiving land. From the southern reaches of Rifstrond up to the ice floes of the Nor-Sae, the seacoast is rocky and windswept, the waves are high and the waters cold. Thrymgard is a land inspired by Iceland. And just like Iceland, Thrymgard has two things in abundance: wind and fog. It may seem contradictory, but that's just the nature of the land. The strait linking the North Sea and East Sea is called the Ormsund. It snakes its way between the icebergs in the north and the jagged coast to the south. Few captains are brave enough to sail through the shifting, treacherous paths in the ice, and fewer still return from the attempt. Jökulsárlón (that is actually a real word) is a glacial lake along Iceland's southern coast that flows into the ocean. It is filled with calving icebergs and is an absolute marvel to behold. Literally, the "Protected Islands," these volcanic islets and collapsed calderas form the seat of the Thrym realm. The city of Jarlstad is neutral ground where the fractious tribes of warriors can meet to settle their disputes and make their law. 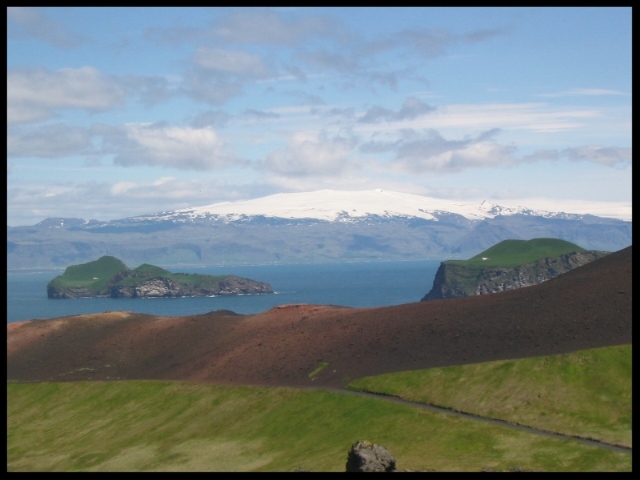 The Hlifseyjar, and all the other isles of Thrymgard, are based on the Westman Islands in Iceland. Their beauty belies their bloody history. The south coast of Iceland is routinely scrubbed clean of foliage by glacial floods. Whenever Vatnajokull or any of its sister volcanoes erupt, their crowning glaciers melt and unleash a torrent that wipes the land clean. That's the inspiration for Örland, the northern region of Thrymgard. Whenever the Eldfjoll erupt, they send tides of mud and ash across the land. The few folk who live that far north have learned to watch and respect the mountains. Map by Rick Britton. Photos by Ander Levisay and Mike Levisay.